I did not analyze what would be the impact of reading Isadora‘s My Life, on my own life, my own perceptions are here underscored in some ways, in others, I could not agree with her less; I will not be a critic of her life, for that would be to also criticize my own and other women’s, unfairly. But, the parallels to any woman’s life must be so significant as to require a full scale review of the book, and aside from dime novel mysteries which I read to put me to sleep, I have not been moved to finish very many books recently, so overwhelming has my own life been in the past few years. I did try to read deeper books previously, but have not been so engrossed in one novel since college, that I can remember. A discussion group of this book would be so large as to include artists, women in general and celebrities, as well as powerful and successful women such as politicians, and mothers, of course, and any sons of mothers who are sensitive to this life. There was so much that Isadora tried to do in her short life. It is though she knew she had fate nipping at her heals, and startlingly enough, this prophecy was given to her more than once by fortune tellers and the like, whom she seemed to run across on her sort of mystic journey. She did discount them, and was actually very realistic, down to business and not the idle dreamer represented historically or in cinema. She was not sure whether to believe them at all, but in recounting those instances to us, she did feel they might have had a deeper meaning than she at once thought. She definitely knew she was off her path of her life’s purpose, she knew when she veered, and even with her great love affairs, to try and balance love with a serious profession, and motherhood, was to her the chief obstacle to being in love and ultimately the inevitable sacrifice of the woman-to man. At one point, she weighed what she had accomplished, how much money she had accrued, by a certain age, and though she felt money and unhappiness were inextricably linked, and she sought to reduce her bank balance religiously (in order to invest in her dreams), she was moved to increasing action by the fact that all of what she hoped to accomplish was not nearly done. Her dream hinged on the Isadorables, which she did not call them, but they came to be called, her children, dancing as an orchestra, freely and understanding the nature of movement, to the music she enshrined as part of her nomenclature, her theater and her school. Her school, was not ably represented in any country, by any government until quite late, but she did manage to seed a generation of dancers none the less, who mastered her ideals and dance technique, and who, for a time, actually taught younger students, and she felt they got it. 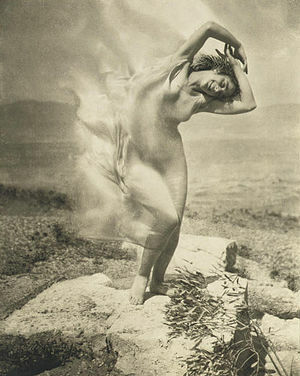 It is a real shame that what she incorporated into dance and into the living of a dancer’s life is not enshrined in our culture, as a service not only to dancers and artists, but to young ladies, for to understand her is not only to love her, but to embrace what it means to be a woman and to cautiously balance a life. Her travel did not only have to do with her vision and dancing, but was promotion, for her school, an idea which she felt, at the end, might be the one true vestige of her career that would last, and the only part of her life it seemed that remained stable. Like many lives, which feature great losses, upheaval and turmoil, sometimes the keystone of that life, what is left to always go back to, is not love, or children, but a mission, built up from pure love, no material gain, and her investment, her stocks and bonds, was her school. Her children, her home, the school was always there for her. Even when she lost her own children and wandered as Persephone, seeking her children, it was her school, and teaching her children, who needed her, that was her salvation and brought her back, even temporally, to life, to responsibility. Men were useful to her, her friends, and because of them, she was able to go on with her mission-they made it possible, but they did not fulfill her completely, except briefly. She quotes, about her mature relationships, from Oscar Wilde, “better the pleasure that lasteth for the moment, than the sorrow which endureth forever.” This increasingly became the case, when her possible soulmate(s) died or were married, unavailable, or for reasons of dependence, were set aside, for they took her energy reserved for her art. But as for her school, she conceived the idea to tour and to request funding for her school, supporting the war effort, and a American support of France, by dancing the Marsellaise in America, in her own way, calling for allied support. Her school was the focal point of these tours, establishing the fact that whether the United States liked her or not, this was American, she was American, and this was the future of dance, hers, and women, she. She wizened-up in her later years, realizing that to flog a dead horse, entertain a lover, might be a waste of her time, and she sought to impress less, and to ask for more, to be more direct, and had a clearer vision of her goals, and quite simply what would and what would not work. The next part of Isadora’s life was spent in Paris, where she felt she had support. Long before the actual running of the school had been turned over to her sister, Elizabeth, because the German authorities had felt Isadora’s promiscuity and lifestyle were wanton, Isadora complied and had relinquished administration duties-one cannot really expect her to continue in that capacity-how else could she continue as an artist? As she points out in her book, funding the school herself and rearing 20 children in Germany and now another 20 in France, was just one of her supportive roles. All of her money was spent on this endeavor, for where would they go without her? Where would they be, many of them orphans? Even though Isadora found support in Paris, they imagined and wrote more about her that was shocking, for she claims she never really gave them reason to and this is her claim whether she lived as they saw fit or she didn’t, she did feel that to trample her was their goal, and she gave very little consideration for what they wrote, except to comment that what they had found shocking, wasn’t particularly-she must have known that they did not perceive her deepest secrets or understand her. She did not seek people out for support and clearly she felt that support was truly not with her, alone, lost, with only a few people who truly understood her, and forgave her. Her goal then became to find a millionaire. It just hit her as the way to fund everything, much as a mother goes into the world looking for a way, this was Isadora’s device, for it freed her to pursue her art, and provide for her children, her own daughter and the many others she supported at her school, including her own family members, mother, brothers and sister. It was all up to her alone, to save the sinking ship, and she was good to her word. Very fortunate in that men adored her, she spent as much time pursuing men who would not sacrifice their homes, marriages or celibacy to have passionate love affairs with her, but in one she found a mate, for a very long time (for Isadora), who was also the father of her 2nd child, her son. Strangely, L. and Isadora were brought together by tragedy and compassion of spirit, and were separated by tragedy and culmination of spirit. The lifecycle of their relationship was like a second relationship (for Isadora) and he seemed drawn to her mothering instincts. Likewise, he supported her, but the loss of her children (one his), and bother of hers, was, not surprisingly, the end of that affair. When L. did resurface, it was to remind her of her mission, the school, and to offer to support her in that at least, which proves he did have concern for her and more sense than she credited him with having. She, likely, did not bear as much concern for her other male amours, due to her art. She did take from them what she needed to continue, but such is the life of an artist, and making art was as much a part of her being, as she realized later on, as was her ability to mother, foster or act as a muse, to inspire others, and later in life, politics became a dominant part of herself and her power. She did not seem at first to think very highly of her dancing, not as an art, not important, girlish and whimsical, but later in life, she came to understand the importance of art to her being and this, I think, gave her the understanding of it, to believe in it herself and validated it for her and then she was truly able to convince other people. Isadora could sell a trinket, but she could not defile her art. It was part of her roots. Her one statement regarding L, besides her comments on his neurosis, was,”All money brings a curse with it, and the people who possess it cannot be happy for twenty-four hours.” She believed this until the time she died. Despite her love for L., she felt relief when they separated-freedom. To take care of someone you loved was more tiring than performing, traveling, for it was fatiguing to the senses and drained you. Perhaps she was ordaining some post-apocalyptic vision when she stated that in the maternity ward of the future, women would have music, flowers, and surreal peace of mind as an environment in which to deliver their children and not the bestial conditions that existed for child-birth then, and her feeling was that women would have everything to do with the control and direction of this phase of life, as the understanding of it went entirely with women. But we have progressed to this way of thinking, much more slowly than Isadora, but eventually, she was right. Isadora projected onto her lovers, some of them, a strange gloom, in the case of L., neurasthenia, defined as a complex of symptoms characterized by chronic fatigue and weakness, loss of memory, and generalized aches and pains, no longer ascribed to in Western medicine, but still characterized in Chinese medicine, and other ancient cultures. Isadora did not complain and she did not have any memory loss. When she suffered, it was from abject grief, so she ruled out other maladies and appeared to be quite healthy otherwise all of her life. I do not think she liked to talk about weakness, in herself or others, and she wanted to accomplish too much to spend time licking her wounds, except one big wound, but up until this point, she referred to many people as losing touch with reality, giving up the fight, being suicidal, and perhaps she was exposed to so much to this it haunted her after her children’s death, not as preparation for her own life’s loss, but likely, it was that she dwelt upon and recounted those associations and their possible meanings later in her life when she was forced to sit down and deal with her own grieving, try to survive the suffering, and look for helpful answers from her past experiences. Generally, there was a certain malaise in Vienna, turn of the century Paris, and depression which is artistically and historically significant, called the fin de siecle. A time when industry, communications, art, all were combined together in a very overflowing pot, and many afflicted stragglers, unable to deal with this monumental societal and industrial change, could not survive. A time when traditional values and mores came into direct opposition with modernist thoughts, ideas, and modes of life, some people could not endure. Her tragedies seemed similar to these others in some ways, feeling too deeply might be another way to put it, before the crust was callous enough to withstand the effects and changes occurring, when a move away from religion, the state and order, to the self and wants over duties. Pride goeth before a fall. In all a somewhat, self aggrandizing period of history for some; for others truly freeing and exhilarating. For Isadora, who now felt that the caprice and selfishness of men, who called that love, was nothing more than an evil, and false love, that jeopardized her Art. She felt she had to give up one for the other. She called it her spiritual line, an upward curve, and all that “adhered to and strengthens this line is our real life-the rest is but chaff falling from us as our souls progress.” She felt that there was never to be any accord between love and Art-a constant battle. She was torn similarly with her body, her canvas, being wrought with the ugliness of pregnancy, and risked her career to have her son, she felt, now with the full knowledge of the changes it brings. She was disgusted with herself, her own weakness, giving up her Art for childbirth, motherhood, but she did it again and she makes us aware of this choice, not cowering behind the martyrdom of it, but rather in picking up her cross, bearing it once again, seems pure duty, and she does does ask for our pardon. She was visited again by spiritual entities and dreams, she was quite possibly a clairvoyant, foreboding the folly of motherhood, the fact that in the end, this was a trick, that it would not turn out well, and that it would be a boy, and somehow was in vain, would not make a difference. She knew not how. One would think these were the rantings of a madwoman, or a self-promoter, except she did not still, at the time of writing this memoir, understand fully, as we do, her fate, or the relevancy of these positionings to her actual history, for of course, she did not see herself as we do, and therefore could not benefit from her own advice. Perhaps, she remembered these things later, when she was consumed by her loss, and attributed them to an earlier time, but she was warned in having her second child, of death, and later when she is taken to that place again, where those visions occurred, she cannot stand the memory, loses all control, in remembering them and had to leave, the meaning of them realized to her now. But still she does not think herself a medium. Not just the time when she bore her son, but up to (and after) the time of their deaths (by automobile accident) was she absorbed with them, in the book, and seems to pass rather quickly, as though, even at the time of writing, she cannot dwell on them very much, for the thought and memory of them cause her too much pain and anguish to bear. It influences all of her book and becomes quite morbid actually, and surreal, ending very quickly, as though like myself, there is further understanding that must take place, closure has not occurred, and the rest is quickly written, not a real ending to her book. It seems once she brings them up, she cannot let go of them again in her thoughts even to complete her biography. Perhaps the fact that their death consumed the rest of her life, would be fitting punishment, according to those two writers I referenced in the beginning, who felt that she was weak and a bad mother. If I learned anything at all about Isadora from reading this book, it is about a woman who has sunk to the bottom of the pit of the stomach of life, been drowned by bile and acid and rose from the ashes to continue living. It is about the strength of the human spirit to persevere, not just during calamity, but when you are building up that fortress by living a full life and one that does not bow down to oppression and convention, that life is short, and by wasting it, even one day of it, you take away part of what you can build up in reserve, when you just might need it. She did that, and probably was able to see this period of loss through, because she was strong and independent. Whatever you call it, Isadora was superhuman strong, and was tested in the fire, for mothers the ultimate testing. Why would we even digress, dream or think about something so awful-I cannot even bear to watch movies where children are used for describing truthful situations or crimes, even though I know they exist, to give them proper attention, or is it to sensationally create entertainment of a bass sort. I do not know, but I cannot bear it. Nor dreams of danger to my children. It was almost as if, she did create a certain amount of her own problems in the beginning, spiraling inward as life went on, to achieve a certain amount and to clean up the opinion and life that in other ways was messy, disorganized and demonstrates less achievement when we view it now, than it certainly really did, for without knowing, she achieved more than all people could have hoped for when you consider she only set out to dance and to survive as an artist in a world where women were viewed as chattel, and whose favors might be exchanged for power, as they had been for centuries, but where true individual power for women still was abhorrent to men. She found this, but she also devised ways for getting around it. She also would have been bored with a more mundane life, was not meant to be wife or concubine, but rather goddess or queen, except coming to depend on a man for finances, even during early motherhood, makes us weaker, but perhaps only those of us who have been truly independent and successful know that. It is a concession you make so as not to be alone, especially when a mother, for it is seemed necessary to have the support and presence of the father. I think she endured them, rather than loved them, for she felt for once in her life, the purpose in their necessity, and then never forgave herself the folly. Save for motherhood, which she felt she could do and was womanly, as Demeter serviced the earth, Isadora served dance and women and artists alike. She served everyone, without really being aware of it, she was the epitome of the female as vessel, giving until she had no more to give, instead of dying, she was taken violently, having spent her course. Her death might have been a kindness to her as she claimed never to recover fully from the loss of her children and it is possible to love to deeply, too much, as part of our beings slip over to our children and we live through them, until they grow up, and as weeds, many of us find it difficult to find water or reason to survive. Isadora found strength in being needed. She was able partly to transfer that feeling of usefulness to her students, but would not ever get over the loss of her children, she needed them, and no one else, ultimately, but even she did not understand the metes and bounds of that loss or those lives until they were taken from her and what might have been, hope, suddenly no longer was. Perhaps a conflict existed in her that she was not a true bacchanal, and that motherhood blighted her artistic self-how could she been seen as the earth mother, if she despised the process of birth? Birth is violent, sudden and wholly reaffirming as having power over every part of the cerebral self. It takes you over and becomes you, you are a slave to it, and perhaps Isadora was more spoiled than she thought-not quite the person she projected, quite ignorant of this use of the body which she did not foresee as being her weakness. Her true use, but otherwise, Isadora was a modern woman, faulty, questioning, curious, vain, self-obsessed, and a true artist. Eccentric, crazy, impulsive, but deep down an average woman. Isadora was blessed in death, in a way, for she would not have liked getting old and being resentful and unhappy, for she was joy and repeated often in her book that she was like life sprung from marble, innocent and pure, when no sin was gleaned from exposing the body, dancing in bacchanal joy, or expressing oneself, and conventions did not exist. We all have to thank her, not be her, fortunately, and most women would prefer to sit at home, have babies and never set out on a journey and be obliged to follow-through on so lusty an attempt to uphold our own actions by radiant convictions, and true to all save one, she did, gloriously. But all of the things in Pandora’s box did exist, they just were never allowed to escape, until Pandora opened that box and released them. In another way, the analogy could exist for the life of Isadora Duncan to sum up all of the tragedy and passion of the Greek mythology, oddly. Her life conjures all of these great losses, glories, visions, magic and largess, without her own realization ever. She never mentions the similarity once, so either she is a very great writer, or a very great moral and lesson to us, that life can copy art to destruction, and history does repeat itself. We can all learn from Isadora, and much more about life than about dance. She was also advanced in her thinking, and as today, many men still have a problem with a woman’s intelligence, so they did then. This gave many people reason to dislike her, but she did not seek to rationalize her feelings, she just accepted them. She dealt with, on a larger scale than most of us, with great men, their endeavors to bed her, wed her, and heave her out upon the street, seeking to demoralize her in the offing. She was forced to acquiesce to their demands much as we are in the workplace, home, or wherever we find them, and she dealt with these issues, too. The difference is, she would have to find a new life, we a new job or new mate. Consequently, oftentimes she was moved to explain herself to others, who were not as forward-thinking as she, that love can be hate, turned around, and vice versa. She felt she loved more deeply than most, and yet she only talks about her hate with revulsion or with naivete, feeling we will not be able to distinguish the two, but at the time of this writing, this woman knows both. There is a side to her book which is self-serving and purposeful, for she does not tell all. She forgets that there are readers sometimes and goes off into lala land, but then the true Isadora is surmised as existing somewhere just beneath the surface of the book, and we can all guess, most of the time, where her true feelings lie. She felt that she did not hate, but rather loved America, too much, she finally said, as a sort of apology to people who felt her behavior was less than grateful, but knowing her, she probably believed this to be true, for much of what she repeated, if often enough, she believed. Like the lover who she said, is rude to you, not because they hate you, but because they love you too much. She felt that psychologists could explain this feeling better than she, but she felt her work in the world was American, born here, raised here, nurtured here, and time would find was representative of her native influences. It has. She believed in being poor in cash and being rich in humanity and she put her money where her mouth was, repeatedly. She was an ambassador of good feelings, inspiration and philosophy of art. She was a professor of dance. Though she may have been desperate at times, maybe mostly, she was not any different than the rest of us, so despite her claims to reassure herself, and to go on in battle, and she needed to continue, there is nothing that is different here in personality, except the choices she made and the path she chose, and the variables that exist in any life, could have happened to any one of us. But perhaps that is what is so important about this book, as we realize the great are only human, like us. She did believe in the theater, a home to great art, for great art, is necessary, but not all the additional artifice of man, or the expense. She felt great art comes from the human spirit and needs no externals, “just the beauty that flows from the inspired human soul, and the body that is its symbol, and if my Art has taught you anything here, I hope it has taught you that.” Her life was no frills. Heavy losses, great joy, and travel, soul searching and at least part of it deflating, where she is bass, like the rest of us, all of her experiences she thinks are for nought, compared to the loss of her childen, and her escape from that inner sanctum, where she lives, penalizing herself for something that was really just an accident. Finally, her death, which is not described in her book, but which we cannot help but read into the pages of this book and after, are left thinking, that it was a complete life, lived in a condensed fashion, and we wish we could tell her that it was okay to have lived it the way she did and to console her. She believed her children were there, calling to her frequently, and that she could join them in another life, for that was her view of life really, recycling. In my book of constellation, Isadora will take the place of Orion, or Andromeda, always appearing in the night sky, with her children in tow on her chariot, ready to do battle.